« Beef & Chicken Lasagne. Or Lasagna. Tomayto, tomahto. A celebration. A celebration of life no matter how brief. A celebration of life because the alternative is a contemplation of loss and the extraordinary sadness that accompanies it. Five years ago on this day, a special soul left our family and this earth. She was 19. An artist, a musician, a budding chef, a daughter, a sister, a cousin, a friend. There wasn’t a funeral, instead a Memorial Mass and Celebration of Life. We had only just moved back to Sydney weeks earlier but there was no question about what needed to be done, so we headed back around the world to family. I’ve struggled with how to write this post for a long time. How to express the feelings going through my head and heart, how to encapsulate a life that left a mark on everyone it came in contact with, and how to do it in a way that honours what she stood for. As with most things I do, it manifested through food – and for A it would have to involve pie. 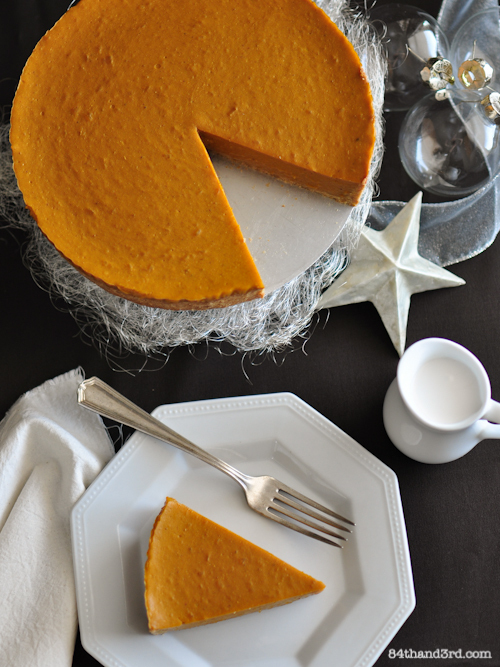 Pumpkin Pie was her signature and made from a classic recipe. These days most people in our family are eating a bit differently to how we did back then, but we are still entirely unwilling to forgo the foods that define our holidays together. 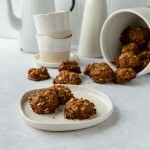 For many family members it is about being unprocessed and ensuring the absence of most allergens – although ironically, wheat, eggs and nuts, while not included in this recipe are not an issue for anyone. So in A’s honour, a creation that we can all enjoy – a no egg, no dairy, no soy, no gluten, no nuts, no corn, no refined sugar, Vegan Pumpkin Pie. Dressed up for a Christmas celebration of life. I’ve not yet been able to make it to the Butterfly Garden dedicated in her name, but every time I see a colourful creature flitting through the air I think of her. I know her absence does not get any easier for her little sisters or her parents — or any of us for that matter — as time ticks along. I wish I could have witnessed her impact on this world as she grew up. I wish she could see her sisters — the opera singer and the photographer — turning into amazing strong women. I wish I could cook with her again. So instead I’ll bake pie and ask you to consider one of her wishes, that everyone would register to be a bone marrow doner and give blood and platelets to help others suffering with leukaemia. And I wish you a peaceful holiday with your loved ones. Fly high beautiful girl, we miss you. 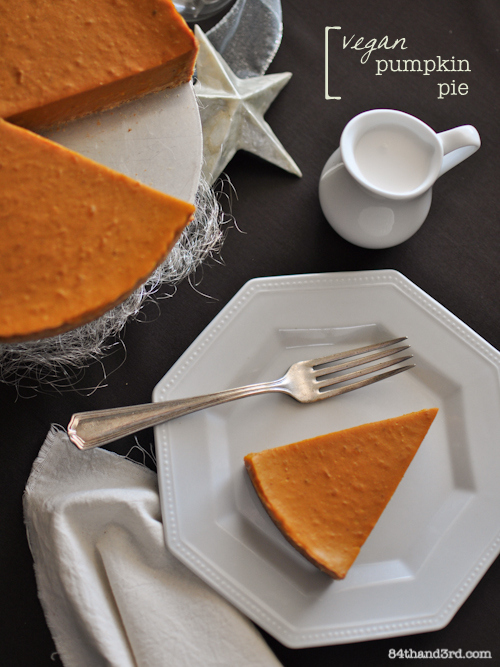 It’s no secret how I feel about Pumpkin Pie and while there is no egg, no dairy, no soy, no gluten, no nuts, no corn and no refined sugar in this one, it is packed with gorgeous holiday spices and a creamy custard filling. Because everyone deserves pie. Prepare and bake your pie crust according to recipe. Start cooking filling just as the crust is removed from the oven. Combine arrowroot and water in a small dish and stir to mix well. Set aside. 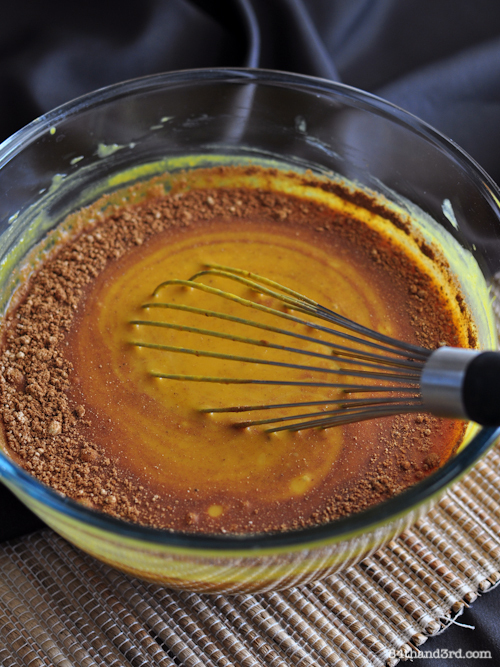 In a large saucepan, whisk together remaining filling ingredients (pumpkin through sea salt). Place over medium heat and cook, whisking regularly, until mixture begins to bubble — about 5 minutes. Turn heat to low and quickly add arrowroot and water mixture, whisking vigorously for 30 seconds. If using arrowroot remove from heat and whisk for a further 1 minute; if using corn flour, cook for a further 2 minutes while whisking. Tip immediately into the warm pie crust and smooth the top with an offset palette knife . If you want a pretty pie do not touch surface again (don’t say I didn’t warn you). Eat the bit left in the pan while you let the pie cool on bench for 20 minutes. Cool completely in refrigerator for at least 2 hours or overnight. Slice with a sharp knife and serve with coconut cream, Whipped Coconut Cream or Vegan Creme Anglaise. Hug your family. 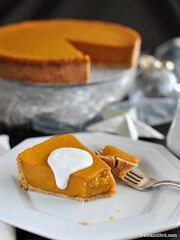 Pumpkin: I’ve made this pie with puree from both steamed and roasted pumpkin — I’d suggest Jap (Australia), Kabocha (US), Pie Pumpkin (US) or Butternut — however you can certainly use a 15oz can. Syrup: Add as much sweetener as you feel is necessary. 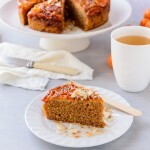 It depends on your own taste and the sweetness of your pumpkin! Maple is sweeter, rice syrup is less so. Honey will probably overwhelm the pie, I don’t use agave. Arrowroot: Arrowroot and corn flour thicken custards the same way and can be used interchangeably with a small change to cooking method. However DO NOT use tapioca for this recipe — in Australia most products labeled ‘Arrowroot’ are actually Tapioca and while it is fine in cakes and cookies, I find it goes very gluey and stringy in custard. Juices and milks: no apple juice? Measure out 1 cup water, remove 2 Tbsp then top up with 2 Tbsp maple syrup. no coconut milk? Replace with almond or rice or oat or hemp or quinoa milk instead. What a beautiful and moving post JJ. I cannot imagine how hard it would be to lose someone so close to me, but through your story I have… Love the celebratory tone of the farewell although there’s a tear of sadness in my eyes too. Lovely recipe – I’m sure A is smiling down at you right now. What a beautiful tribute! 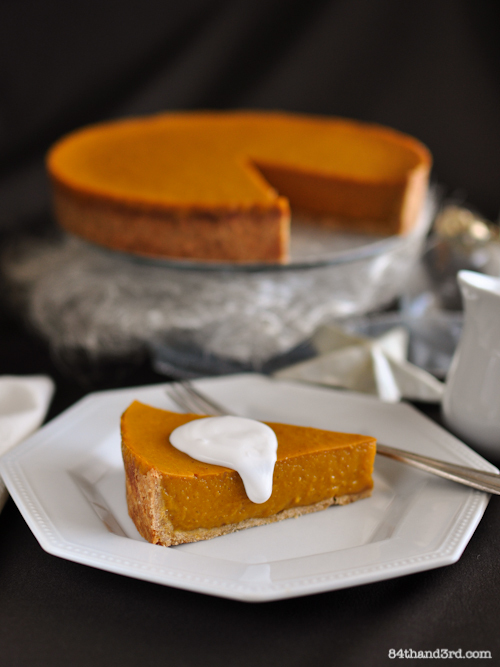 Your vegan pumpkin pie looks so creamy and delicious! 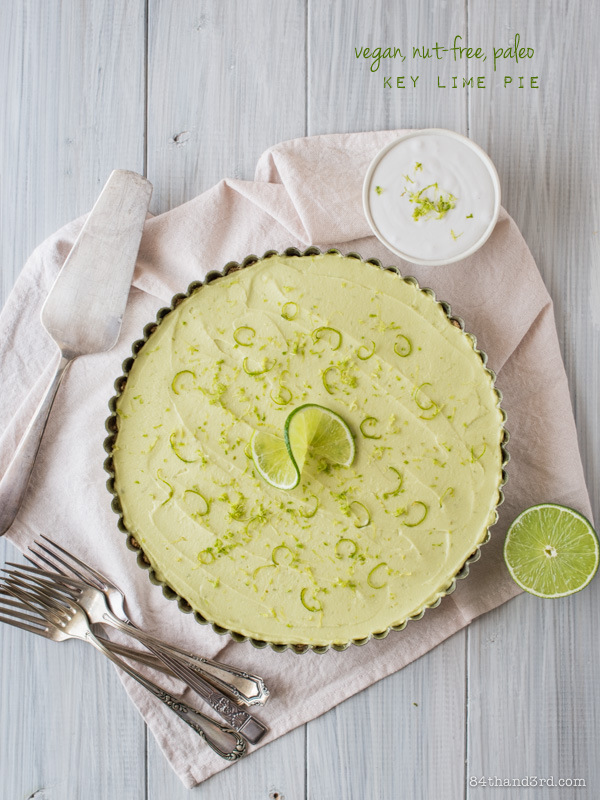 Thank you for sharing the recipe to this lovely pie – it was delicious! 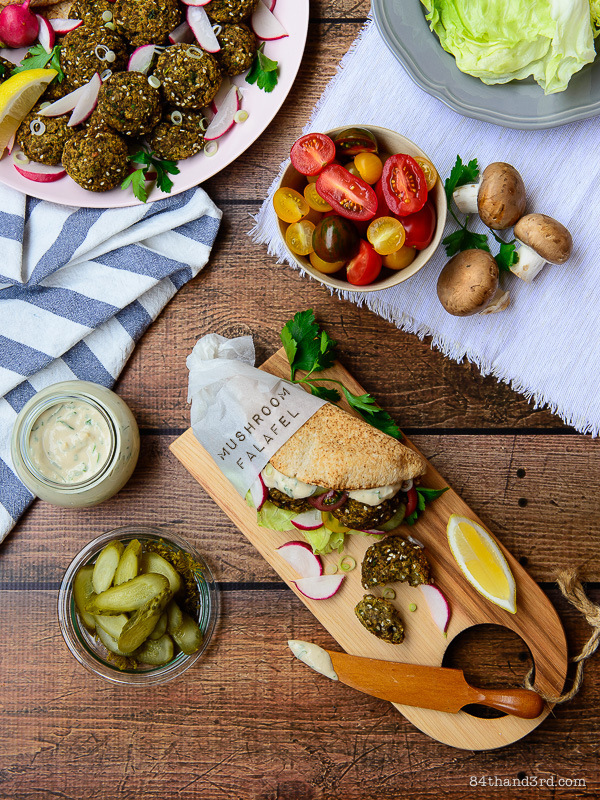 Thanks for sharing the recipe – I’ve been waiting for it since the picnic! Read this to Sophie this morning so she can ‘remember’ A too. Thanks kiddo. Thanks, Jen. Your words and memories are beautiful, and A’s light glows in all of us. Such a moving post. Thank you for sharing, both this recipe and the beautiful, emotional story that accompanies it. What a lovely post JJ. My thoughts are with your family. It’s great to dedicate this post to her, and that vegan pie which is perfect. As hard as this must have been to write, what a beautiful job. Heartfelt sympathy to you and your family. So beautiful, you have a wonderful heart. I work in diagnosis/prognosis of leukemia. Oh JJ 🙁 such a beautiful written post and a lovely dedication to her. Thanks for sharing this with us. This is a strong post! Nicely written … It touched me.. Wish you all the best! Such a lovely post JJ… though I’m so sorry to hear about A. I just wanted to say how much I identify with the manifestation of feelings through food… I felt the same when my grandma passed away last month. My memories of cooking with her will always be most precious. Big hugs to you and your family. such a beautiful post JJ. I didn’t want it to end because I wanted to continue reading. hugs to both you and your family. You have captured so beautifully the feelings of those of us who were lucky enough to know A. 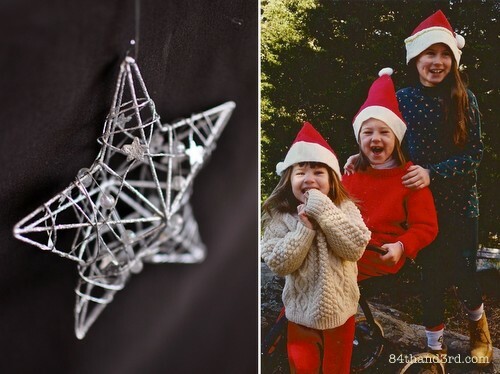 Thank you for such a moving tribute and a special Christmas gift we can make in her honor. A beautiful post JJ, thanks for sharing. 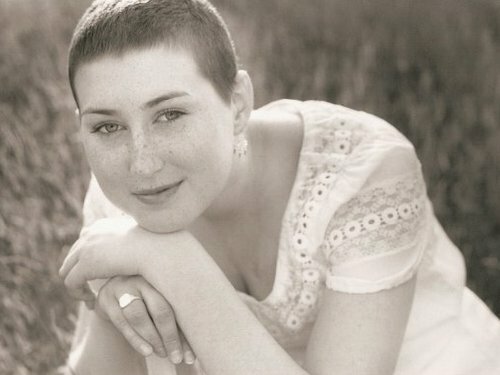 We also lost a much loved family member to leukemia on his 20th birthday, so I share your pain at such a loss. Such a well-written and thoughtful post JJ, it bought a tear to my eye. My mum is currently battling leukaemia, it’s horrible. Hi JJ, thanks for your participation in DMBLGiT January 2013. Wishing you good luck ! I don’t know if you’ll even see this nearly two years later. But, I was looking for a vegan pumpkin pie and my search met your post. Sitting here with tears in my eyes, I can feel your pain as my little girl, Annie(7,) lost her battle with cancer just three years ago this month. She has two older sisters. I’m so sorry for your pain, I don’t think us mommas ever get over it! I might just have to make this recipe not only because it looks great, but because of the reason it was created to begin with. Sharing the loss of our precious “A’s”. But for failing to set my first attempt came out OK. I just had to go ahead and bake it to get it to set up. My pumpkin may have needed to drain quite a bit more before pureeing. Hi Louise, not sure what happened if the ingredients and method were the same as above… actually not sure why it would set in the oven and not from cooking the custard on the stove! Why was the pumpkin draining? Did you boil it or steam/roast? what is the 1 cup of apple juice for? For the filling, added to the pan in the ‘pumpkin through salt’ step. Who knew a pumpkin pie recipe could make one cry? Blessings to you and your family as you remember your beautiful girl in 2015. She may not be with you now, but she is still touching hearts. Thank you! Thank you for sharing! We lost our 19 year old son 1 year ago. He always made the pumpkin pies for holidays. How fitting that I not only find a recipe fitting our food allergies, but a recipe which honors your loved one!